The cover of the Danish book. Unplugged — standing on your own feet, playing to your own un-augmented tune rather than being dependent on your hierarchical position — is the foundation of the style of leadership needed to provide true Affective Safety Leadership. 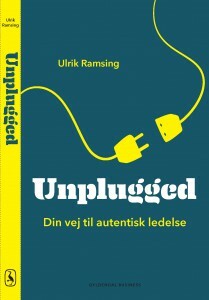 It is also the title of the acclaimed Danish book “Unplugged – din vej til autentisk ledelse”, roughly equivalent of “Unplugged – your path to authentic leadership”. As a sample of the broad acclamation and fine reviews, please see Ulla Bechgaard’s review as she gave it five out of six stars in Jyllands Posten, one of Denmark’s largest newspapers. Click here to download the full PDF-version. Additional and very frank peer reviews are found at Saxo.dk. For de interesserede og danske er der lavet en 90 minutters workshop, der introducerer bogens 9 råd. Klik og kig for at se Prezi-præsentationen. A few of the essential topics are summarized in the Mnemonic list giving away some of the most important leadership tools and checklists to an Unplugged leader. CfL Centre for Leadership offers a bi-annual single-day workshop in Danish on the main topics of the book; please see the calendar, CfL’s program or the PDF flyer describing the training in greater detail (DK).